Poquonock Community Church is actually the Second Congregational Church of Poquonock, founded June 2, 1841. The "First Church" was founded in 1726 and lasted until 1820. At that point, unfortunately, the "First Church" entered a very dark period of intemperance and a loss of morals. The meetinghouse was literally left "to rack and ruin." Early in 1840, a Rev. Hempstead (Old records do not give us a first name) was the first to suggest the formation of "Second Church." The response to his suggestion was much less than enthusiastic. Later that same year, a highly motivational speaker, John Ripley Adams arrived on the scene. Rev. Adams was the great-grandson of John Adams, Second U. S. President, and also a grandson of our Sixth U. S. President, John Quincy Adams. By the following spring, Rev. Adams led the people in founding the Second Congregational Church of Poquonock. Rev. Adams' pastorate was the shortest in our church's history, less than a year, but it will always be the most far-reaching. Were it not for his first pastorate, everything that took place since then could not have otherwise happened. The meetinghouse was constructed and the church was officially dedicated on April 12, 1854. Horace Bushnell was one of the honored guests at this dedication. Over the years, three pastors have served what could be called "Long Pastorates." William Carr served 1907 - 1922 (15 Years); Victor Greenwood served 1922 - 1938 (16 Years); and James Silver served 1968 - 1999 (30 Years, 9 months), the longest pastorate in our church's history. Special mention should be made of Pastor Nathan Merwin (1889 - 1898). Several years into his retirement, his wife died. Mrs. Merwin had been so much loved by the church family that Pastor Merwin gave our church the gift of electricity. Meetings, socials and other gatherings could now take place at night instead of being restricted to daylight hours. Over time, the Second Congregational Church of Poquonock expanded its outreach into the community. 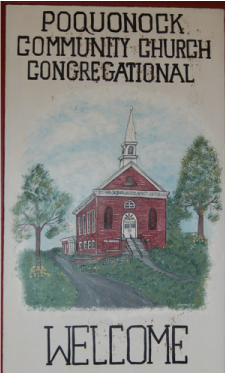 As a result, the church officially changed its name in 1924 to Poquonock Community Church, Congregational. By 1960 PCC had become a member of the United Church of Christ, joining many other Congregational churches in Connecticut in what was then being called "a uniting church". By 2005 it was clear that the UCC as a fellowship of churches had departed from Christian orthodoxy to a point our church was no longer comfortable with. The congregation became independent and began to search for another wider body we could be part of for fellowship and care. Our search led us to join the Conservative Congregational Christian Conference in 2011. On October 3, 1979, a tornado ripped through Windsor and Windsor Locks, leveling several homes, seriously damaging the Bradley Air Museum, and destroying the historic meetinghouse of Poquonock Community Church. Miraculously, all but one of the art deco windows from the old church were salvaged and placed in the new sanctuary, which was dedicated in 1980, along with an expanded fellowship hall (named for Rev. Robertson, who died while pastor of PCC in 1964). In 2011 PCC called Rev. Jonathan Colegrove as our 29th Pastor. Jon is a Connecticut native and has been a pastor and shepherd for over 30 years. In 2014 the congregation took a bold step and called our first full-time Associate Pastor, Christopher Johnson. In March of 2017, Chris was ordained by the church as a CCCC pastor.